Gov. Larry Hogan won’t support Donald Trump. A poll shows most Marylanders approve. Newly elected Governor Larry Hogan gives his acceptance speech at the watch party held in Annapolis, MD on election night. Support for Republican Gov. 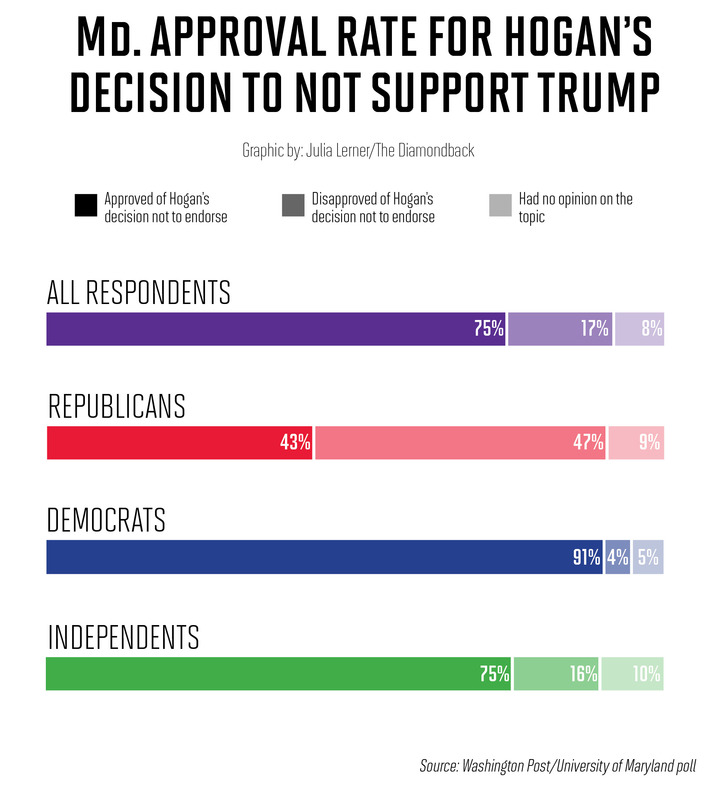 Larry Hogan has hit a record high in the state of Maryland, but his popularity does not translate to support for the GOP as a whole or presidential candidate Donald Trump, according to a University of Maryland-Washington Post poll released last week. Hogan’s approval rating is up to 71 percent — his highest ever since becoming governor in January 2015, the poll found. In a state where registered Democrats outnumber registered Republicans by about a 2:1 ratio, the governor has fostered popularity by avoiding controversial issues and focusing on the state’s economy, said Stella Rouse, director of this university’s Center for American Politics and Citizenship. The center regularly conducts state public opinion polls with The Post. Jacob Veitch, president of this university’s College Republicans chapter, said Hogan’s actions — such as lowering taxes and tolls and supporting birth control access — are popular with most people in the state. Veitch called Hogan a “special politician” who is governing in a way Marylanders want. “He has an ‘R’ in front of his name, but he’s doing his best to be the governor and not the Republican that’s in charge of the state,” Veitch said. On the other hand, UMD Democrats President Jake Polce said Hogan has “done a really good job of not doing a whole lot of anything.” While avoiding “hot button issues” and staying out of national politics may help the governor’s reelection campaign, the junior government and politics major said that the 2018 race will not be a sure thing. 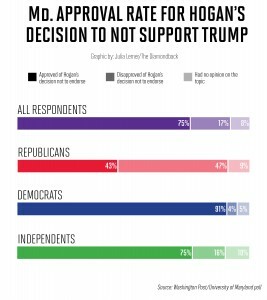 Despite Hogan’s popularity being on the rise, 63 percent of Marylanders disapprove of the Republican party as a whole, the poll found. The governor’s refusal to support Trump has been “hugely popular” in the state, Rouse said. The poll found that 75 percent of Marylanders — 91 percent of Maryland Democrats, 75 percent of the state’s Independents and 43 percent of state Republicans — approved of his decision. While there are some more conservative pockets in the state, Maryland’s Republican base is “certainly more moderate” than others, Rouse said. Matt Morris, Terps for Trump president, said although members of his organization supports Trump’s stances on the economy, immigration and jobs, as well as his socially liberal positions, Hogan’s refusal to support the candidate is a “smart move” for the governor of such a liberal state. The poll was conducted Sept. 27 to 30. On Oct. 7, The Post published a leaked video from 2005 in which Trump is heard making extremely lewd comments about women. Morris said these and other comments have hurt Trump throughout the election season, but there is, “more substance behind some of the wrong Clinton has done” while in office. He said the leaked video should not have as much of an impact, and that the media does not necessarily offer a fair portrayal of the candidates. “While that is something that should not be said and while that is something that is very negative toward our view of women, that really is more of an emotional issue about Trump and more of a personality factor for him than Hillary Clinton deleting 30,000 emails,” Morris said. WikiLeaks released thousands of emails last week between John D. Podesta, the chairman of Hillary Clinton’s presidential campaign, and aides, Clinton family members and donors that involved Clinton saying her personal wealth made her “kind of far removed” from the middle class, according to The New York Times. Veitch said the leaked video of Trump “basically 100 percent explains” why many people, including some Republicans, do not support him for president, adding that Trump has been saying negative things about Hispanics, Muslims and other groups throughout the campaign. “It’s just disappointing to see that it took attacks on … white women to be the thing that set people off,” he said. Democratic candidate Hillary Clinton leads Trump 63 percent to 27 percent, according to the poll. Democratic candidate for Senate, Chris Van Hollen, also leads Republican opponent Kathy Szeliga 58 percent to 29 percent, according to the poll.